Posted by Gyaniz in Ads, Marketing. All through my MBA days I had studied this brand, its evolution and how its has made a mark across the world without using conventional modes of advertising. 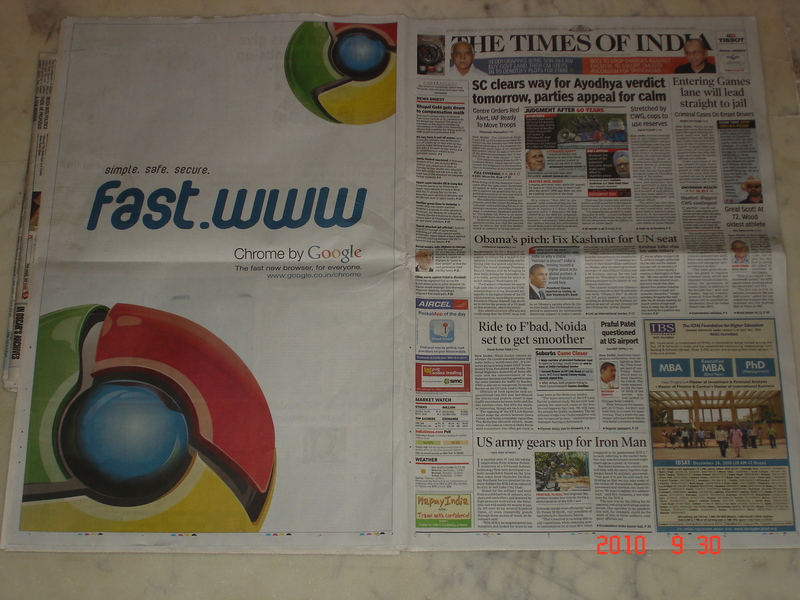 So, on 29th sep’2010 the full page ad of Google Chrome spread across the daily Times of India’s back page, came as a surprise which broke a few marketing notions I had in mind. Why?? and What?? Prompted Google to market using the print media?? 1. Opinion making and motivator for download: Online ads still do not lead to opinion making, while social media has taken word of mouth to the next level, the online ads have still remained on the same platform where they were in India 2 years back if late evolution compared to Social Media is taken into account. 2. Effectiveness of Print media in India: Chrome’s online advertising has been around for a while, while things have started looking good (see graph), conventionally targetting the Indian consumer and closing the deal with a print campaign would have appeared the safest bet. 3. 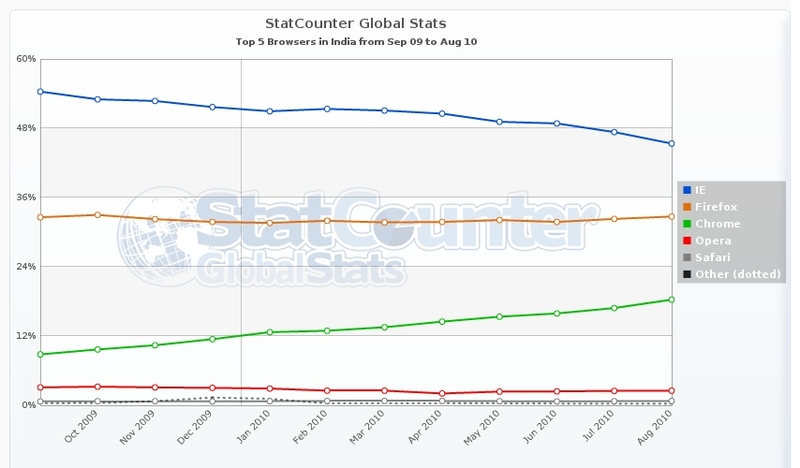 Recent debacles: Google Wave, Nexus One and the losing popularity of Orkut and its loss of its market leadership position to Facebook, has led Google to take the more conventional mode and thus, capitalize on the upward trend of downloads (see graph) for Chrome by buying mainstream Ad space in publications like Times of India which have a considerable readership across their English speaking, net savvy target clientele. The development is good, and proves the symbiosis that can occur with print and online media. The move would prove healthy in terms of increasing sub brand & product’s recognition and awareness. They right mix is what needs to be targetted E.g. city editions which have higher young readership can be much more effective both in terms of cost as well as reach to the right audience. Your views and comments invited.